I went to watch my first ever live football match in the famous Manchester United's Old Trafford stadium. 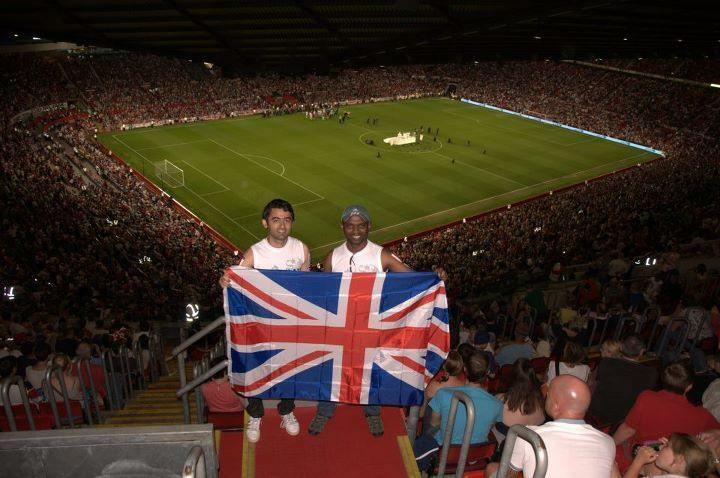 My friend Prabhu Seerangan suggested me about the Soccer aid 2012 tournament in which England was going to play against the "Rest of the world". It was a friendly match for charity and both teams contained some famous celebrities. Some of them I remember were Robbie Williams, Olly Murs, Michael Oween, Gerrard....etc. The match was on a Sunday evening and the start time was 8.00 pm. We had to leave from London. We checked the trains fares but the fares were quite expensive. Hence we decided to take the National Express coach to Manchester coach station. The price of each coach ticket was about £30 return (London to Manchester and Manchester to London). We might have got it a bit cheaper, had we booked a bit earlier. And the price of the match tickets started from £20. Our coach was going to leave London Victoria coach station at 8.00 am. We decided to leave early so that we could explore the place near the stadium as well. Being over cautious about reaching early to Victoria coach station, I reached Victoria at 07.15 itself. However unfortunately the train that Prabhu was going to take was late. Moreover there was some confusion with the bus timings as well. Hence he had to take a cab to rush to the coach station. At 07.45 I requested the coach driver to wait for a bit as Prabhu was going to be late. But the driver told me that he can't wait and that the bus will have to leave exactly at 8.00. At, 07.57, when the driver was just about to leave, I saw almost 4 different people rushing into the bus. But Prabhu wasn't there. He asked me to to take the coach and he would take the cab to the next coach stop, if he got late. At, around 8, when a passenger was rushing into the bus, I got a call from Prabhu and he said he was just outside the coach station. I told this to the driver but as mentioned by him earlier, he wouldn't wait. Exactly as the bus driver started the bus, I saw Prabhu running towards us and the driver opened the door for him ! It was just like one of our bollywood movies the only difference was us not being a couple ! It was a fantastic sunny day and was great fun travelling in the bus.Though the journey time was around 5 to 5.5 hours, we didn't get bored because of having eachother's company. The bus took a few short breaks at some stops. By the way, just for you guys who don't know, usually the long distance National Express coaches do have a toilet at the rear of the bus. Look out for something like WC on your ticket. Finally we reached Manchester. From the coach station we walked to Manchester Picadilly station, which wasn't very far from the coach station. Before we took a tram to the Old Trafford stadium, we roamed near Manchester Picadilly station. We saw some awesome musical instruments including acoustic and electric guitars, synthesizers, drum kits etc, in a huge music store, from there we went to a nearby sports direct shop to get some England flags and stickers and other match goodies and finally had a good mean at Frankie and Bennys. We walked back to some tram station, but ideally Manchester Picadilly station would have been ideal. From there we took 2 return tickets to Trafford bar (One can also take direct tram to Old Trafford). See Tram map here. From where we walked to the stadium. It was about a 10 minute walk to the stadium. On the way we saw people dressed in red and white and cheering England. It was nice to see all the cheerful and happy faces. We took a few pictures in front of the stadium. We showed the tickets to the security and followed the directions to our section of seats and finally to our seat. As we were climbing the steps to our section we could hear the volume of the roaring people in the stadium increasing with every step we took. It was just awesome ! We took our seat and were then treated with some awesome music and dance performances by some girl dance groups. After that as the players entered the stadium they got a huge cheer from the spectators. The match started and I think the first half of the match was dominated by the rest of the world where they scored a goal and put England behind by 1-0. At half time I thought it would be quite tough for England to come back. However after half time England fought back to level the score to 1-1. The whole crowd including us went wild when England scored ! After that England immediately scored 2 more goals in quick succession ! Now we were quite happy that there was no way that The rest of the world was going to come back. England got a few more chances but they missed. However for me a win was sufficient and was much more than a huge score difference. It was a great match. After the match was over we followed the crowd to the nearest tram station and took a tram to Manchester Picadilly. I think the cost of a return tram ticket, which we initially bought at Manchester Picadilly was about £2.50. After reaching Manchester Picadilly, we had enough time to have a nice and juicy chicken shawarma in a middle east food joint. We walked to the coach station and took our return coach which was scheduled at 23.59. It reached London Victoria at 06.00 the next day. Overall it was a wonderful experience ! And I would love to go to Manchester again to see the lovely, cheerful and happy faces again.